When Stainless Steel Stains: Read up on stainless steel before rivers of rust ruin your ride. “All that glitters is not gold” is sage advice for many things in life, but it rings especially true for stainless steel hardware. As a marine surveyor, I see plenty of stainless hardware failures, some due to the use of poor quality stainless, others due to poor installation practices or lack of maintenance. But what exactly is marine-grade stainless steel, and why does even the “good stuff” occasionally fail? Let’s take a look at why stainless steel stains. Stainless steel generally lives up to its name, assuming that the correct grade or series is used for the job at hand and that it is installed and maintained correctly. Most of the stainless steel hardware found at a typical chandlery will be from the 300 series, the various types of which are suitable for a wide array of marine applications. Type 304 is a good, basic, multipurpose-type stainless steel. Add a bit more nickel content and molybdenum to the mix and you get types 316 and 316L, both of which have improved resistance to corrosion. Type 316L features a lower carbon content to prevent carbide precipitation (and intergranular corrosion) when welded. transitions the deck (more on why in a moment). Such failures often occur even though the chainplate may look pristine above and below the deck penetration. Assuming the correct grade of stainless is used, boat owners can help prevent corrosion and failure by ensuring the hardware is installed correctly and properly maintained. To better understand why installation and maintenance are important, a general knowledge of basic boat construction is helpful. between an inner and outer layer of fiberglass. This construction is typically used for the transom of powerboats as well. Cored construction produces a structure that is stronger and lighter than a similar panel of solid fiberglass, with greater acoustic and thermal properties as well. One downside is that any penetration into the coring can allow moisture entry if not properly sealed during installation or if the caulking used to seal the hardware breaks down due to age. Unless the coring is isolated or sealed against moisture (a rarity among many boat builders) the coring absorbs this moisture, resting like a wet sponge against the fastener. That’s when it gets ugly. Over time the oxygen in the water is depleted and the protective chromium oxide film breaks down, unable to renew itself. At this point the iron in the stainless starts to corrode, resulting in expansion and the “running rust” stains indicative of hardware in trouble and in need of immediate attention. So, what’s a boat owner to do? Deck hardware (including transom-mounted stainless) should be pulled and rebedded (re-caulked) periodically to prevent leaks. This is especially true for hardware that experiences high or cyclical loads: windlasses, cleats, chainplates, stanchion bases, and the like. The flexing caused by such loads breaks the bond between the caulk and hardware over time, allowing water entry. There’s no hard and fast rule regarding how often you should recaulk, but the general consensus is that deck hardware should be pulled, inspected for damage and rebedded every 7 to 10 years (more frequently if the situation calls for it). 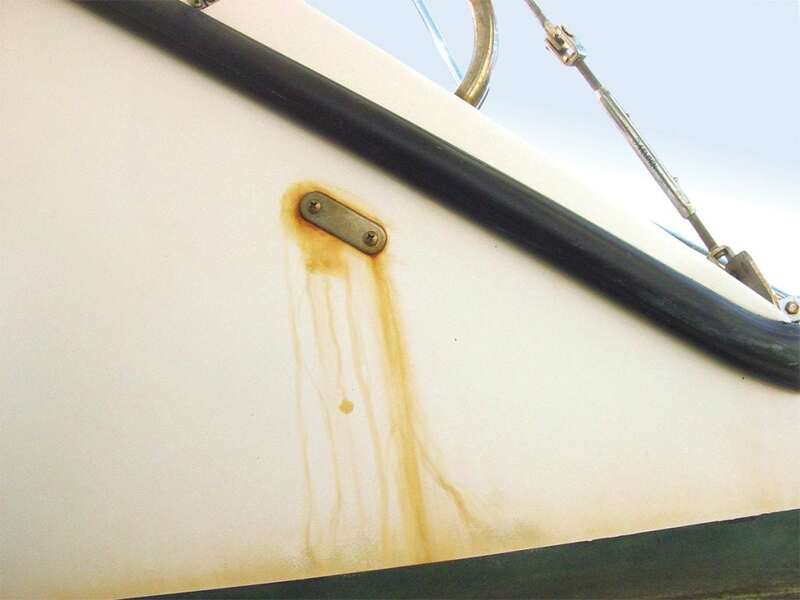 Another thing to remember is that gooping sealant around the outside edges of a leaking chainplate, stanchion or other pieces of deck hardware in efforts to stop a leak is like throwing sawdust against a waterfall. The fitting has to be pulled and rebedded, or you’re just wasting your time. This also allows you to inspect the hardware and deck coring for issues. To sum it up, be alert when buying stainless steel. Nuts, bolts, clamps, fastenings, and other such hardware are available from a seemingly endless number of vendors, both online and at “brick and mortar” chandlery stores. Some are more reputable than others, so don’t let low pricing alone guide your purchase. Always verify the grade of stainless you are buying and if purchasing locally, trust but verify by carrying a small magnet, since 300-series stainless should be nonmagnetic or nearly so. When testing hose clamps, be sure to test the screw as well since many cheap stainless clamps use a plated steel screw, which can fail rapidly in the marine environment. Crevice Corrosion: a problem with stainless fasteners used in seawater applications where chlorides pit the passivated surface, and low pH salt water attacks the exposed metal. Lacking the oxygen to re-passivate, corrosion continues. As indicated by its name, this corrosion is most common in oxygen restricted crevices, such as under a bolt head. Pitting: Stainless that has its protective coating penetrated in a small spot becomes an anodic, while the coated part remains cathodic, causing a pit-type corrosion. Intergranular Corrosion: Stainless steel contains a small amount of carbon. When exposed to extremely high temperature (welding, for example) the carbon forces local chrome to form chromium carbide around it, starving the adjacent areas of the chrome it needs for corrosion protection. Choose low carbon stainless such as 304L or 316L when welding.